Title: 2.0 Caption: Sequel of Robot – Budget: 400cr which is highest for an Indian film & Shankar will be directing a 3D film for the 1st time! Superstar ‪#‎Rajinikanth‬ – Shankar – Akshay Kumar – Amy Jackson – ARRahman – LYCA! AKSHAY KUMAR : Ending the year on a high note! Super excited to be a part of Robot 2 with the one & only @superstarrajini sir! ‪#‎Endhiran2‬ shot in 3D made with top technicians from all over the globe making it a complete world class film. Legacy Effects from USA, the world No.1 Animatronics company who has been signed in for this movie. 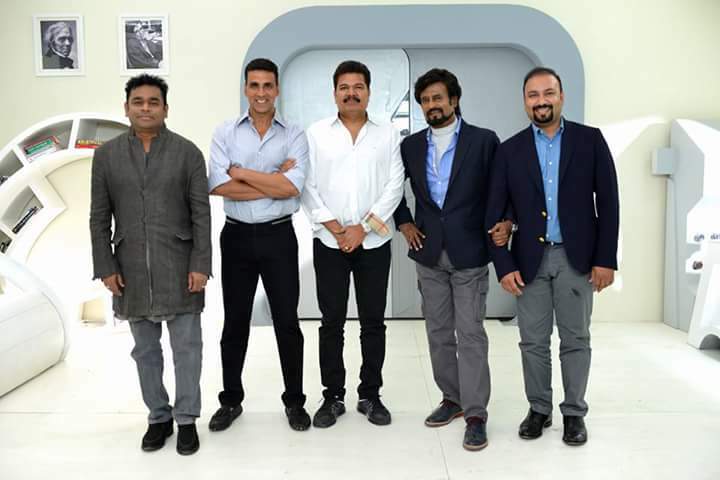 The Much Awaited Shooting of India’s Biggest Movie Superstar Rajinikanth Starrer Director Shankar’s next magnum opus “2.0”, the sequel of Enthiran the Robot has finally started in chennai 0n 16th of December (Wednesday). The producer of this film Lyca productions were planning a grand launch for the film, but due to the recent chennai floods, the film makers decided to start the shoot in extremely simple manner. Superstar Rajinikanth and the lead lady Amy Jackson were shooting for the film when Mr. Akshay Kumar who is doing the equally important role in the film and Chairman of Lyca Group Mr. Subas Karan, Oscar Award Music Director AR Rahman and other joined the crew consisting of cinematographer Nirav Shah, Art Director Muthuraj, VFX Supervisor Srinvas Mohan at the first day shoot. Ace dialogue writer jayamohan (Tamil) is paring up with shankar for the first time. Editing handled Antony while Oscar Award Winner Rasool Pookutty handling the Sound Designing. The movie is being shot in 3D made with top techinicians from all over the globe making it a complete world class film. Legacy Effects from USA, the world No.1 Animatronics company who worked on movies like Jurassic Park, Iron Man, Avengers has been signed in for this movie. Special costumes are being designed by Mary.E.Vogt (Quantm Effects) who has done famous costumes for Tron, Watchman are also the part of 2.0. Rajinikanth and Amy Jackson are the lead Actor and Actress respectively. Superstar’s Daughter Soundarya Rajinikanth also went to the shooting spot accompanying her Father. Amy Jackson is playing the role of a female robot opposite to Chitti played by Rajinikanth.